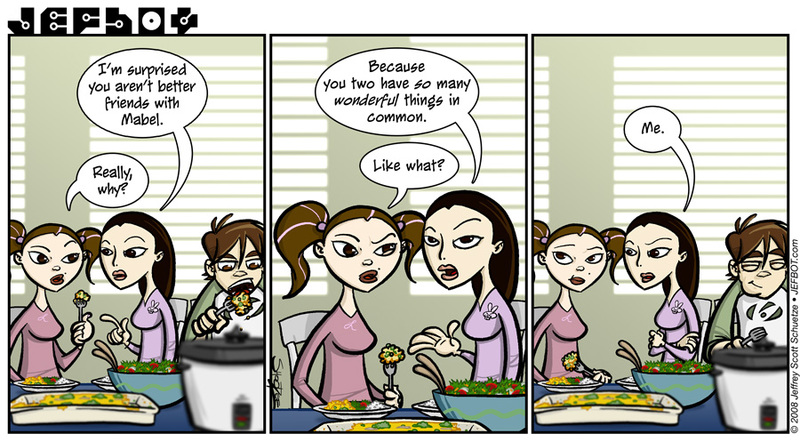 This strip was inspired by a conversation between my two sisters, overheard during a recent family dinner. JEFBOT is a wonderful thing!!! So simple yet so complex. You’re ability to take an everyday occurance between people and recreate for the whole world wide web to see is outstanding. These strips will last forever and future generations will all see how eccentric your sister, Xinda, is. They’ll probably end up worshipping her. 🙂 Great work, bot. As usual. I love the look on your face after you say, “Me” it rocks. No matter how simple or complex, Jefbot is wonderful! Rock on! Keep going, I really like this comic. I really like your art style too, by the way. this is your best one yet!!! I love your sisters, they rock! I wanted to leave a new comment, so that my new and improved avatar would be up! So here it is… and again, I love the look on your face after you say, “Me.” Great job as always Jefbot!!! What a set-up! I agree with everyone else. I love to see your character snicker-giggle. It’s all very funny. i love the crazy sisters. where do you get your story lines? i’m going to kill you again and again and again. remember that movie we saw for your birthday where the guy gets his limbs sawed off and then the dogs come and eat them…? thats you!!! ps. i wrote a little ditty for you, i have to put some finishing touches on it and then i’ll post it 4 u.